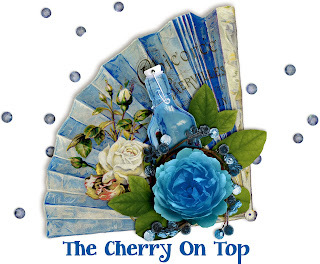 Welcome to a super scrappy edition of The Cherry On Top. 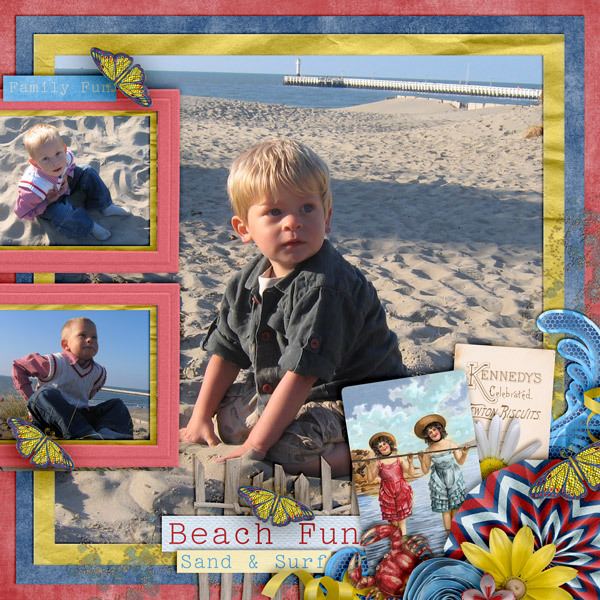 The Digital Scrapbooking Studio has an absolutely gorgeous collaboration for the summer. 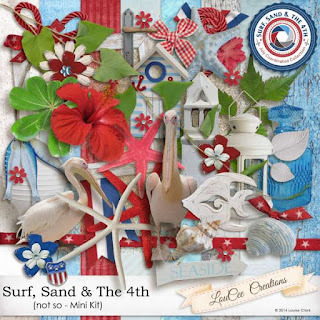 Surf, Sand And The 4th is a sensational mix of mega talented designers and fabulous goodies that will make you melt AND it's all on sale at fantastic deals! I got to play with three designers collections and kits and I'm bringing them here for your further inspection along with..dun, dun daaa...free stuff. Bounce around to all of the hot spots from The Cherry On Top and grab the free goodies. 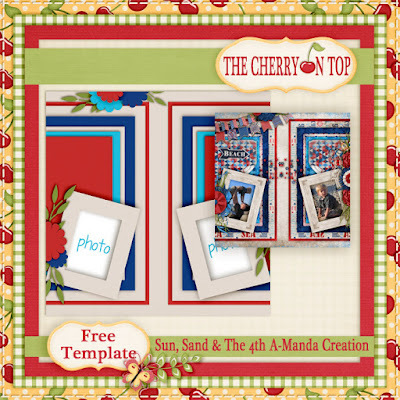 This first layout is designed with A-Manda Creation's collection. 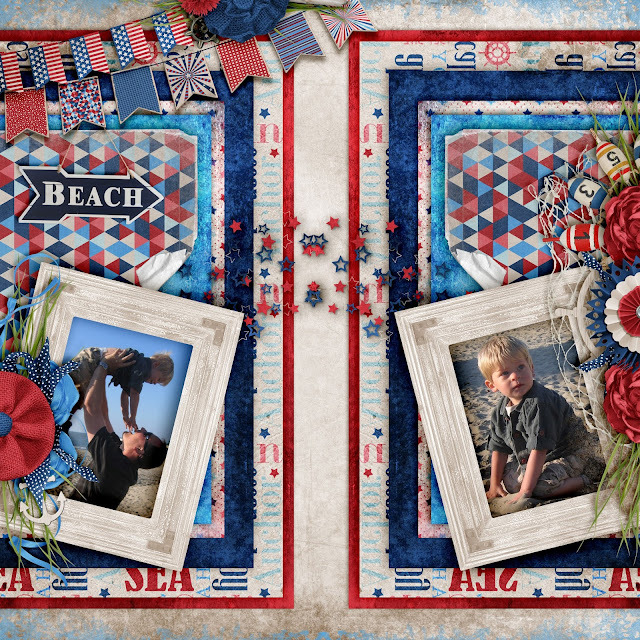 Patriotic colours and beachy elements for all of your sea side photos and memories. This layout was a bit of a hit. So, I thought I'd turn it into a free template for the fans. Here's a look at A-Manda's collection. Click on the image to get to the Studio for a further peek. Next up is LouCee Creations. More fabulous goodies that reflect all of the goodness we love from the ocean and the beach. The papers are pretty amazing and I'm showing them off with two layouts and a free paper stacker. 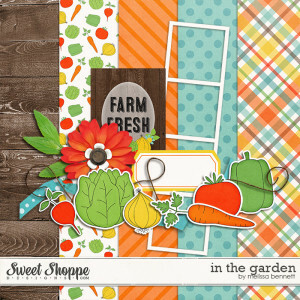 This layout was designed using a template from Brenian Designs. You can find more of her templates, here. I really loved the way this layout turned out. 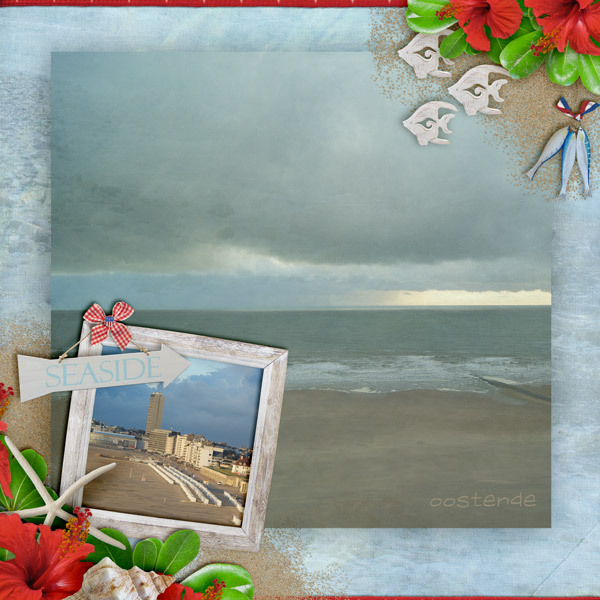 I put a lot of shadow behind my top picture to give it some distance from that terrific background paper of the ocean. I love that one! I'm also a fan of red and hibiscus. I grew up in Florida, by the beach and my heart still belongs there. For a limited time, LouCee's kit is just ONE DOLLAR! Here's that paper stacker. You can find it on our Facebook Page. Click on the image to get there, but keep scrolling to find even more free designs. PattyB Scraps will wrap up this scrappy edition. 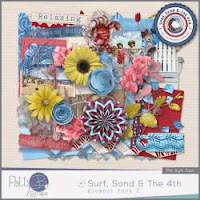 She added a touch of sunshine in her beautiful kit, Surf, Sand And The Fourth and I used it. 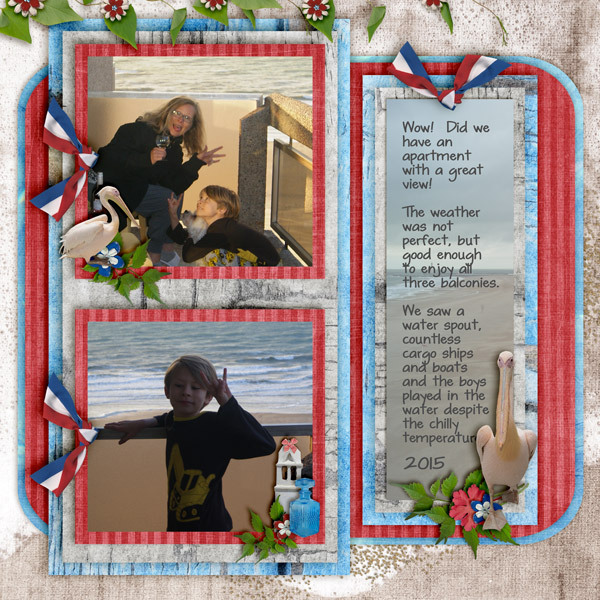 My guys when they were a bit smaller enjoying a fabulous day on the Belgian coast. Patty also has several additions to this collaboration. This is just a touch. Click on the image, above or below to see all of it. I turned this layout into another frickie. Hey! They are really popular and that is because they are so flexible. You can use it as is and just pop in a great photo behind the frickie or you can shrink it up and use it just as a frame. You can also add other elements like I did in the layout, above. Add a couple of frames and some more pictures. Your layout will be ready in minutes! You can find the links to this freebie over on Pinterest. We hope you decide to follow us there. 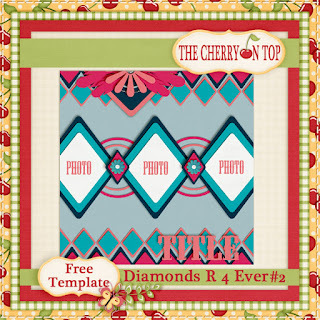 We've got many freebie boards, inspiration and so much more. Pop over there, Follow us and take a look around. Here is your free template. 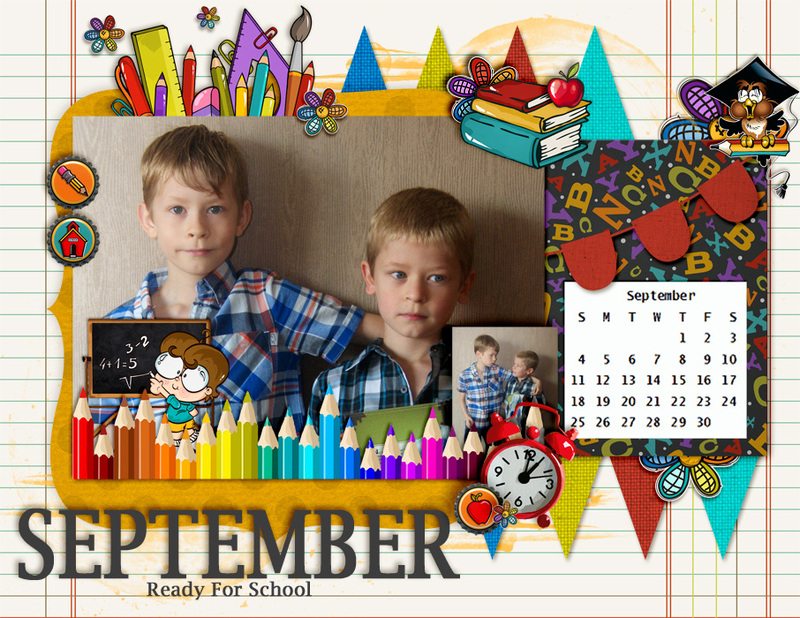 It's available in PSD and TIF format only. Take advantage of the super deals going on over at The Studio for Surf, Sand and The Fourth. Thanks so much for hanging out with The Cherry. Make sure you do it again. Welcome to another enlightening, scrappy tutorial on avatars and siggies. An avatar or siggy is your personalised icon for the internet Whether it be a forum, game or even your signature for e-mail. You can design your own siggy in many software programs such as Power Point, Photoshop, Corel, My Memories Suite...Grab a digital alpha or use your own fonts provided in your software to design your name or whatever wording you would like for your siggy. Embellish with downloads from a digital scrap kit or from legal images you find on various sites like Clker.com, dafont.com, shutter stock, dreamstime, etc...I always work with digital scrap kits. The quality is guaranteed with most of them and private use is never a problem. You can also find plenty of free ones if you know where to look. Like here, our Pinterest board has tons of free goodies and our Facebook Page, too. If you feel you are not creative enough to pursue this endeavour, there are options for you. You can purchase an avatar or even find free ones on sites like deitel.com or imvu.com. 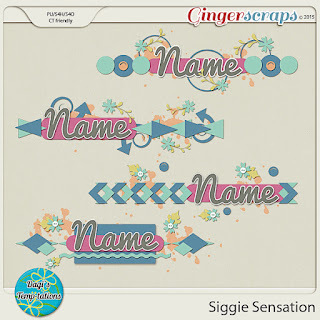 Another way is to use templates specifically designed for siggies or avatars, like the ones pictured below. They cost very little and you can use them over and over. Click the image for the freebie! 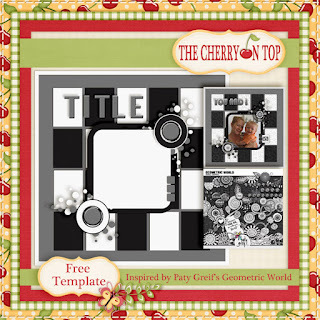 You can even find free templates to use like the one pictured above. How easy is that?! If you don't know how to use a template, it's very easy. It's just a matter of clipping in papers and placing embellishment or even more papers over the template. You'll be ready in minutes! 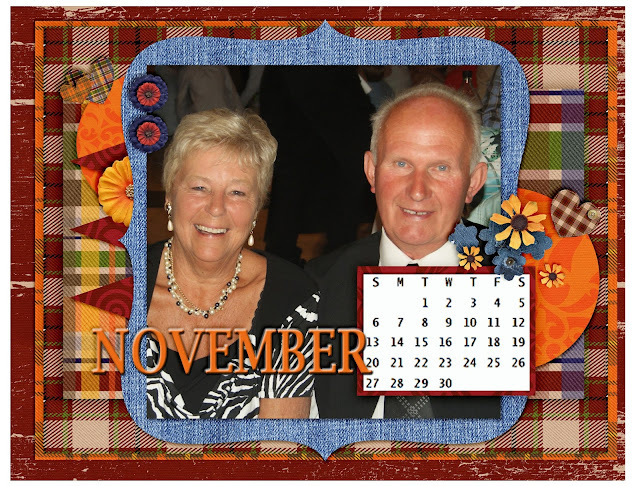 If you want to find out more on how to use templates, click here. We've got you covered! 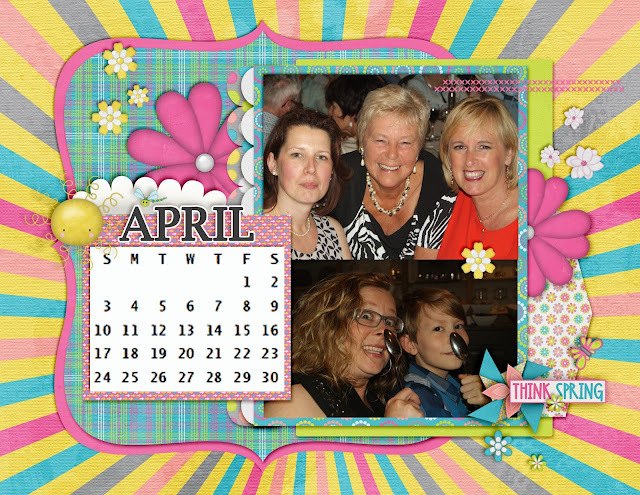 Just type in, "how to use digital templates" and watch dozens of videos. I learned in just a few, short minutes chatting with my scrappy friend over FB. It's THAT easy! Add some shadows. Use your favourite, colours. Include a picture of yourself, if you like. Above is my niece and her siggy I made for her. Her sister is a bit younger and I didn't use a photo for hers. Here, I changed up my avatar for the holidays. Since The Cherry On Top is all about the free stuff, we're providing some currently available, free digital scrap goodies that you could use to make your siggy. This image is hooked up to an entire kit full of gorgeous goodies. 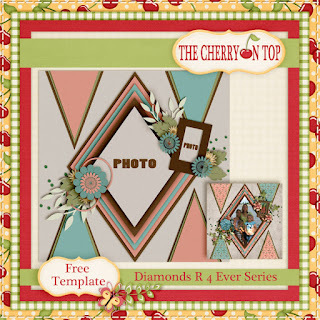 Bella Gypsy is one of my all time favourite digital kit makers. Head over to their FB Page and grab this baby for nut'n! We've hooked up this one, too. 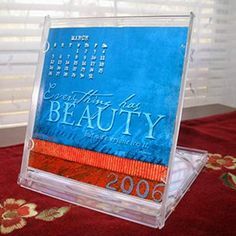 Head over to our Pinterest board, Free Digi Scrap Stuff to find more. In this last example, I wanted each round brad or button you see in between each letter to be linked up to our FB, Pinterest and blog, but my technical skills were not savvy enough. Ugh! I have found some pretty interesting tutorials, though. It IS possible! Type in a search, linking avatars and you'll find a few like this one. It seemed easy enough. Avatars and siggies come in all different sizes from 50x50 to 150x150 and as big as 500x200 it totally depends on where you are using it and the requirements or limitations on those pages. I'd go smaller to be sure it fits most places requirements. So that's the skinny on avatars or siggies. I hope it helped you out. Have a great time creating your own siggy and show us what you make if you like! Welcome to yet another informative series in Dirty Laundry. We are talking softeners this time and oh, my! What I have found is very disturbing, but enlightening as well. Shoo! Just what are softeners? Why are they so dangerous? What are softener alternatives? There is an abundance of information out there. 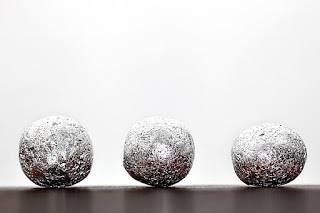 We'll bring it all to you, right here, in the smallest nutshell. Softeners are a chemical compound that prevent static cling and soften fabric. Synthetic materials hold odor and hence, a big reason people reach for softeners perfume. Another great reason to go cotton, right?! Just as with detergents, companies are not required to mention toxic chemicals in their products. Here is list of the toxins found in softeners and the effects they've been know to have. From irritants to nerve damage, be informed. Keep in mind, you are wearing these clothes coated in toxins every single day for nearly every single minute. In other words you are continuously surrounding yourself and your family in toxins. Youch! Think about the money you would save by never buying toxic dryer sheets and softeners, again. Hundreds if not thousands of dollars over time. Of course, you'll also be doing the environment a huge favour and boy, could nature use a break. Did you know that softeners may even damage some clothes? Here is a short list of fabrics that you shouldn't even be using softeners on because they reduce absorption and increase flammability. Obviously, towels, microfibre, athletic clothing and pyjamas. Line dry these. I've done some personal research with my lovely friends and family and found nearly everyone just loves their softeners and dryer sheets. I realise how difficult the decision to ditch this stuff is going to be. So, let us hook you up with several alternatives in hopes that you will get the effect your looking for. 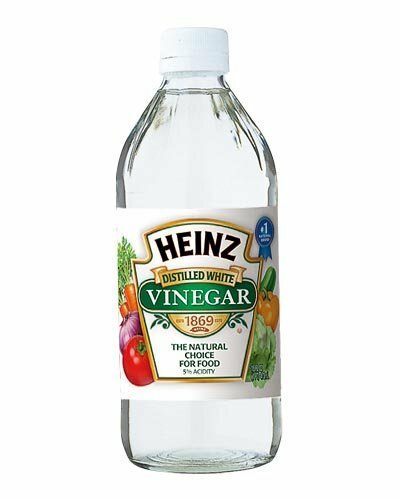 The top alternative for softener is vinegar. If the scent of softeners are your thing, then add essential oils to it. You only need 30-40 drops to an entire gallon of white vinegar. 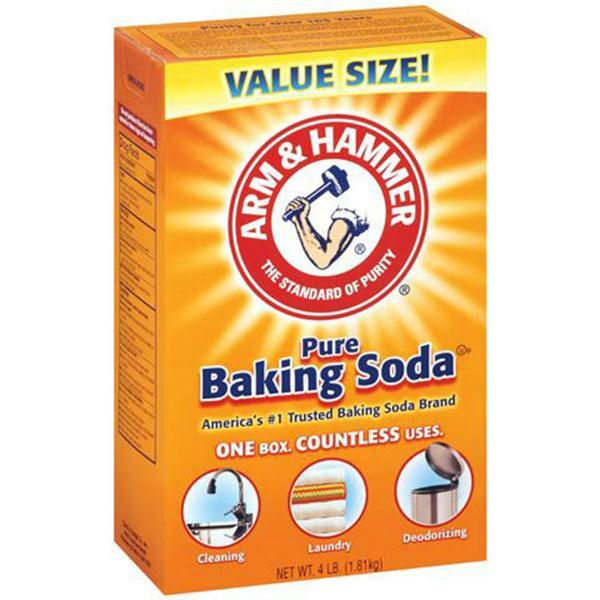 Who much does a gallon of vinegar cost compared to a gallon of your favourite softener? 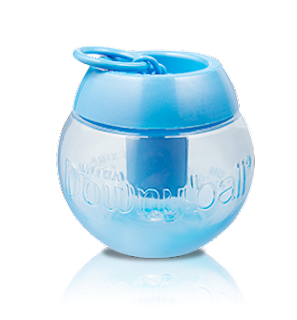 If you have a Downy ball, put your vinegar mix in there or in the softener dispenser of your machine. Vinegar not only softens clothes, it helps reduce soap build up and helps with static cling, too. 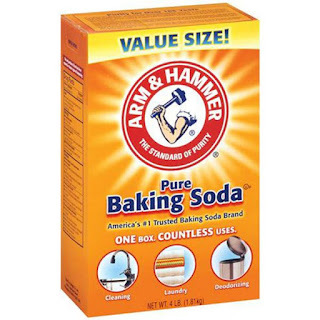 Another excellent alternative is baking soda. Use it in the rinse cycle to naturally soften clothes, remove odors, whiten, brighten, remove stains and it will also help keep your wash machine clean. Boom! that sure is lot of advantages. Wool balls are an other favourite. You can purchase them or make them yourself. 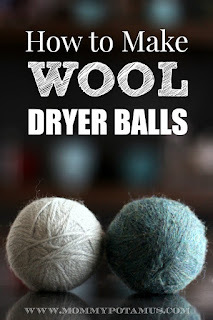 Wool balls reduce drying time and cut down on static. 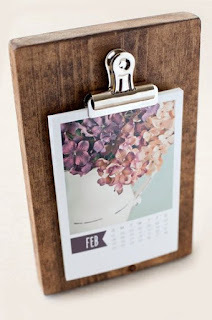 I love the idea of making some as a gift for family and friends. You can even add essential oil to the balls at the end of the cycle and run the machine without heat for extra scent. Find out how to make your own by clicking on the image below. Since synthetic fabrics are the biggest culprit in static clean, try to keep them separate from cottons and hang them to dry, if it is an option. I've found that simply giving my clothes a good shaking out helps ditch the cling, too. I hang my clothes out to dry and that's the topic for the next edition of Dirty Laundry. It saves tons of money. It's the best thing for your clothes. There is no static cling. It's great for the environment and there are no chemicals. Ask yourself, just how important is it that your clothes smells excessively perfumey and just how bad is the static cling problem? Is it worth all of that extra money and toxins that are bad for you, your family and the environment? If you were to use cold water, wash only full loads, wash during non peak hours, make your own detergent, use all natural products like vinegar, creme of tartar, baking soda and borax and hang out your wash, you'll easily save $1,000 a year. Wow! That's something to think about! Welcome to another fun, paper/hybrid project with The Cherry On Top! I've teamed up with Dagi's Temp-Tations for this one. 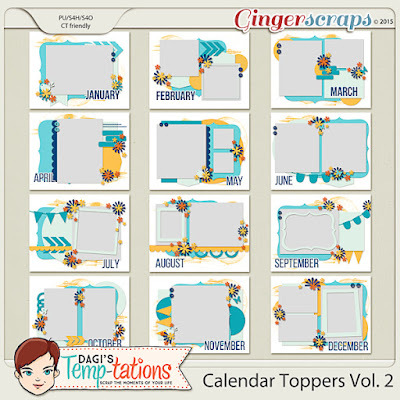 She's got some sensational Calendar Topper templates that just released and we've been playing. 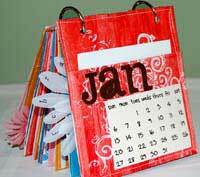 What a fun, easy way to create your very own personalised calendar?! When you click on the above image, you'll get whisked away to Dagi's blog where you'll see more inspiration from her team. They've done it completely different and it looks amazing! 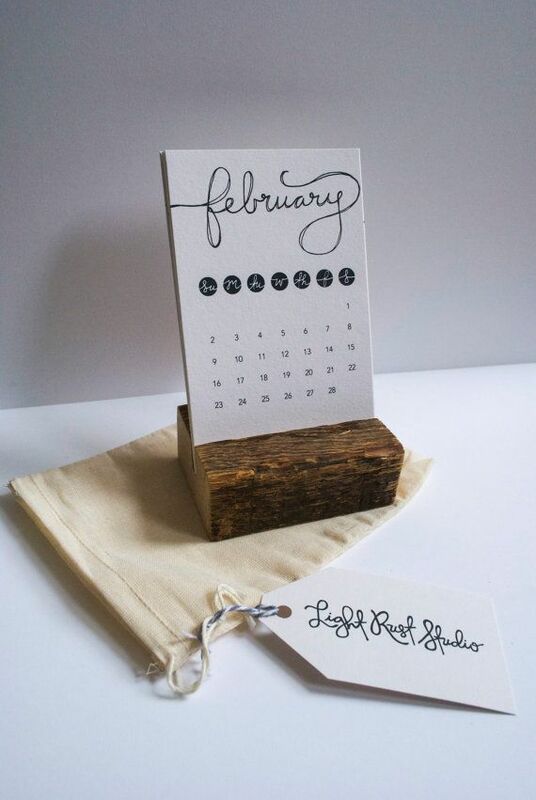 Of course, you can take these wonderful templates, replace the month with a title and use them as a regular template for a layout. I kind of mixed those two together for my project. For me, I want it to look nice and I want it fast! 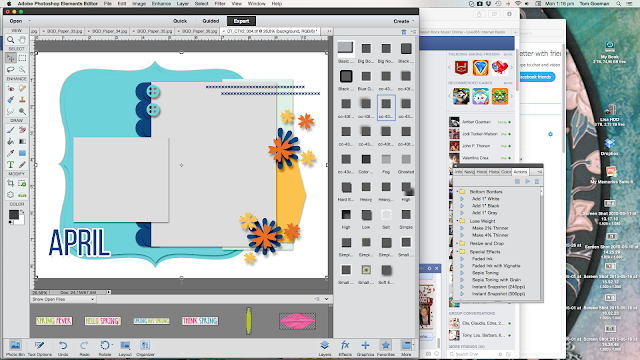 12 layouts is already time consuming enough. I took a downloaded image of a yearly calendar and simply cropped out each month I needed and pasted it on my calendar page. This page was made using Albums To Remember kit, Winter Penguin. You can find it here. Here is the image I used. For some of the pages, I cropped out the month if the title was too, close. Click on the image to get to the link and download the one you like best. Here it's further away, so I left it. You may want more cohesion by leaving it the same on each page. The choice is yours. 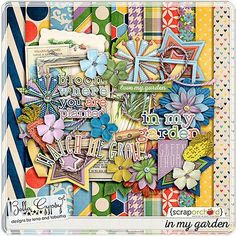 This page was made using A-Manda Creation's kit, Love Rocks. You can find it here. 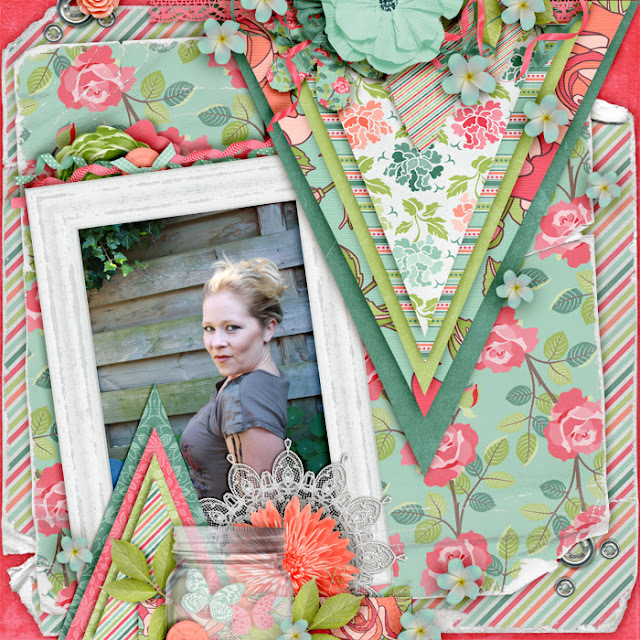 This page was made using Boomersgirl Designs kit, Spring Is In The Air. You can find it here. Here is the original template for April. 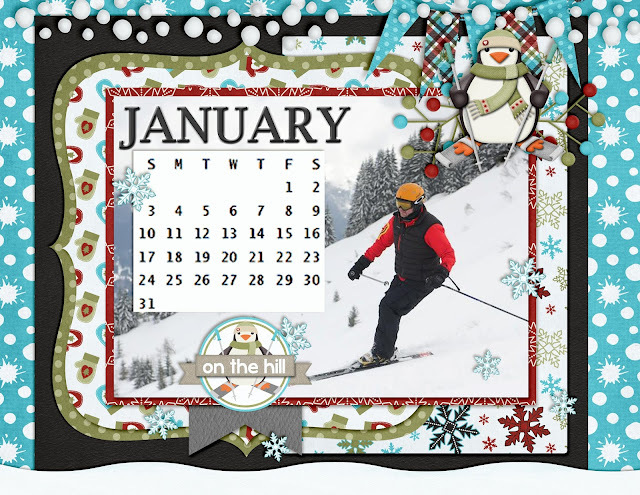 I'm using images and the calendar on one page. So, I had to make some adjustments. Here's a screen shot of how I adjusted the above template to fit my needs. I do this with all of the templates I work with. This page is made using Paty Greif Digital Designer'skit, School Frenzy. Find it here. 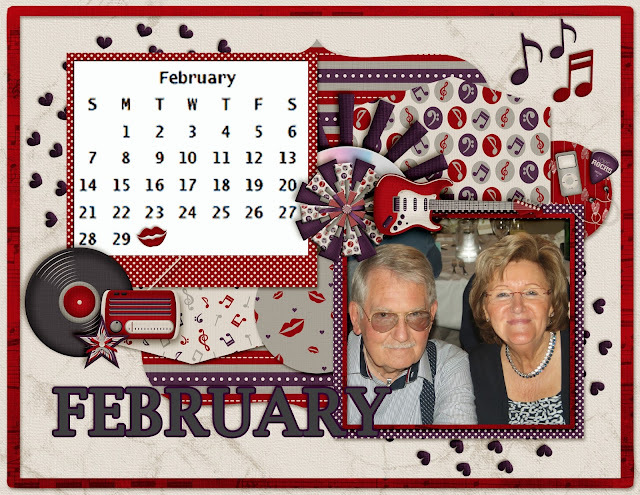 Using goodies from PatyGreif Digital Designer, again. Smart Little Witches can be found here. This is KitCart's goodies. You can find her store here. 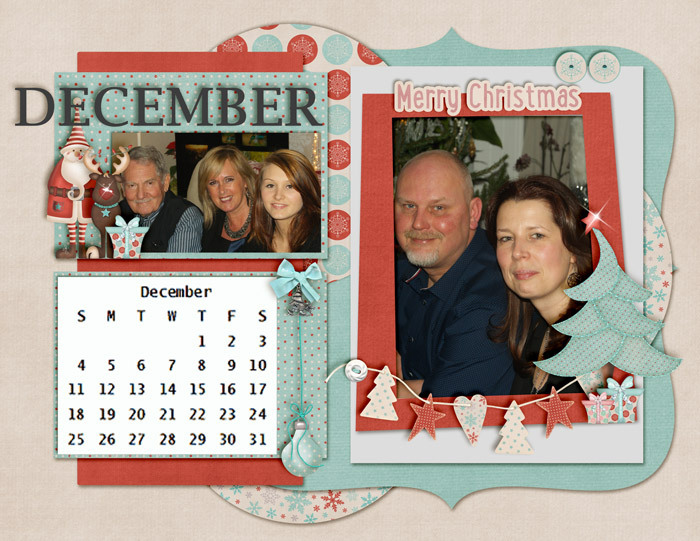 This page was created using LouCee Creations kit, First Christmas Collection. Find it at the Studio, right here. 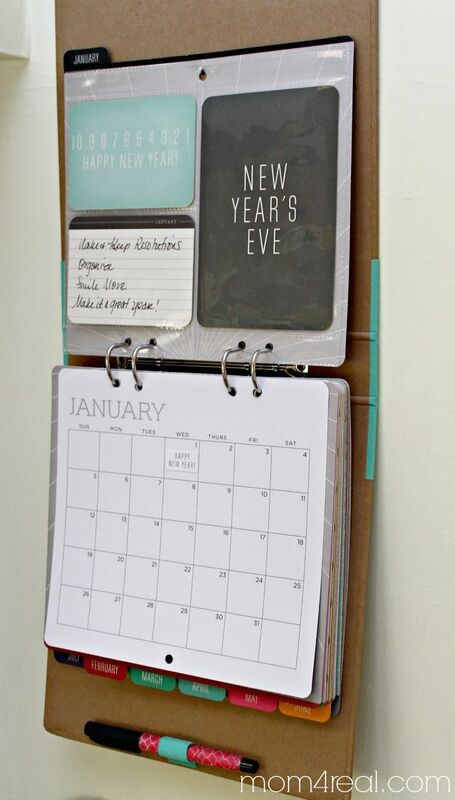 Here are a couple of different ways that you can assemble or display your calendars. I got all of these images from Pinterest. 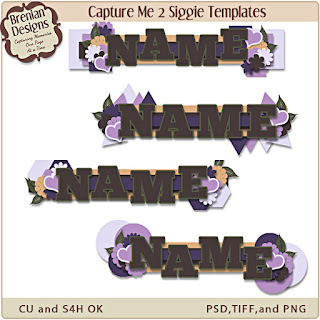 After printing out your completed templates, cut them out. Either leave a little bit for a frame or cut directly on the edge of the image. I left a bit of white for a frame around mine. I use both double sided tape and glue for most of my projects. To make sure it sticks together and if you place your double sided tape in the middle and glue all around the edges, there is room to play so you can position it just right before pushing down for adherence. Just make sure the middle of your paper doesn't touch the double sided tape until you have it where you want it. If you are going to bind like I did here, with a big clip, then how you place your images on your card stock won't matter. I originally thought I was going to punch holes and use metal rings until I figured out that I didn't place my images correctly. Yikes! If you want to permanently bind your pages, across the top, then make sure you have one side right side up and the other upside down. I liked this clip because it was really easy and fast to put together and because I used rigid card stock in-between my pages, I could stand it up. Of course with this kind of clip, you can also hang it on the wall. 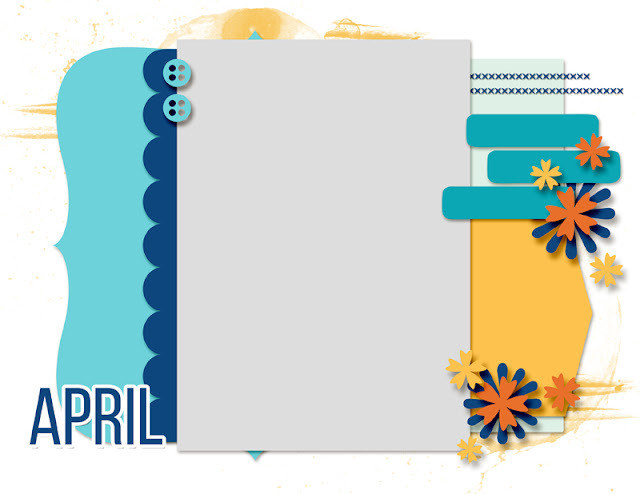 Feel free to add embellishments to your finished project. I added a bit of ribbon to my clip for more added fun. A touch of glitter glue would make a quick and easy edition or inking around your pages for a subtle, polished effect. I inked around my rigid card stock. That's it! Get started today. I read that Christmas is just 20 Fridays away. I hope that's wrong! 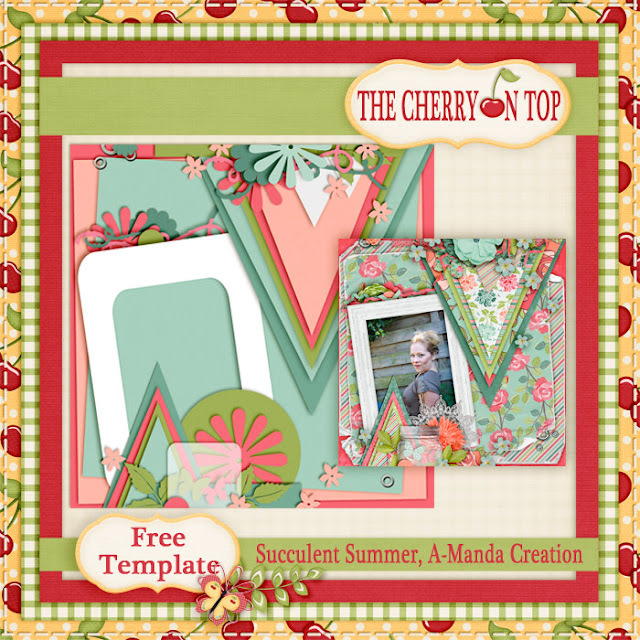 A-Manda Creation is back in the spot light with this absolutely gorgeous new release, Succulent Summer. This colour palette is brilliant and the elements most thoughtful. Full of gorgeous flowers, greenery, lace, butterflies and so much more. I am totally in love with all of these worn papers, too. Excellent thought in the patterns and alway a fabulously quality kit and collection. 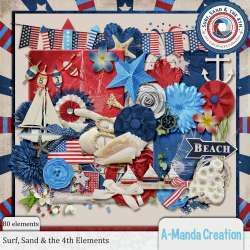 If you want to see more click on the image below and head to Amanda's shop where you can find Succulent Summer and all of her other terrific kits. 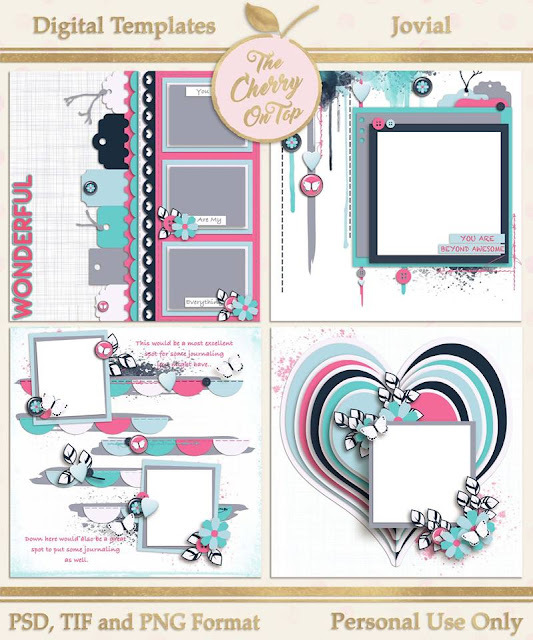 You can also find here goodies at the Digital Scrapbooking Studio. 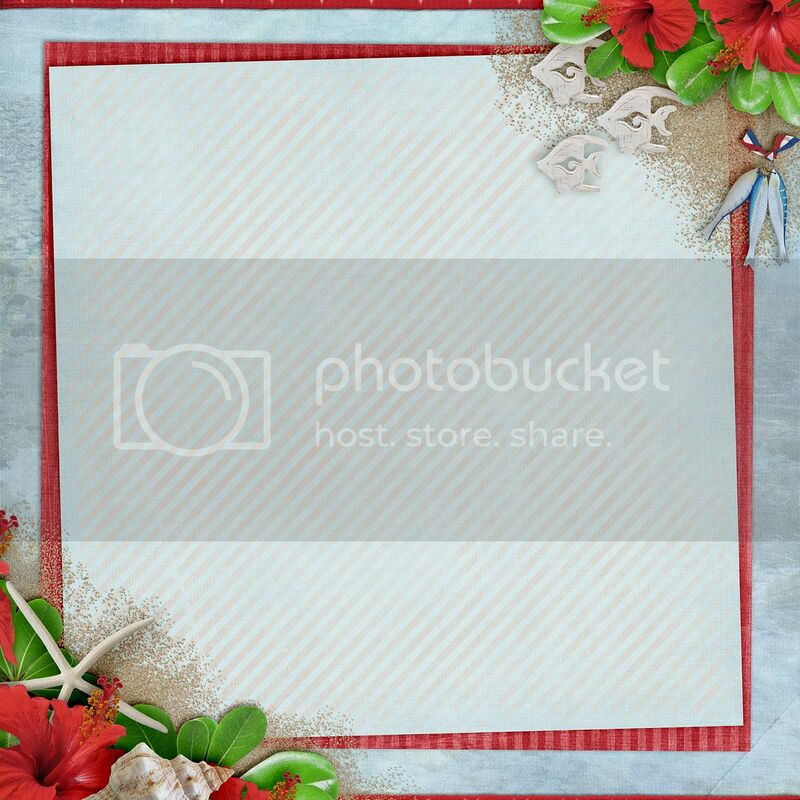 Our Facebook Fans totally hooked us up with some major loving and sharing and so earned this free template. I went as literal as possible from the layout to the template. Enjoy both tiff and psd versions of this template. 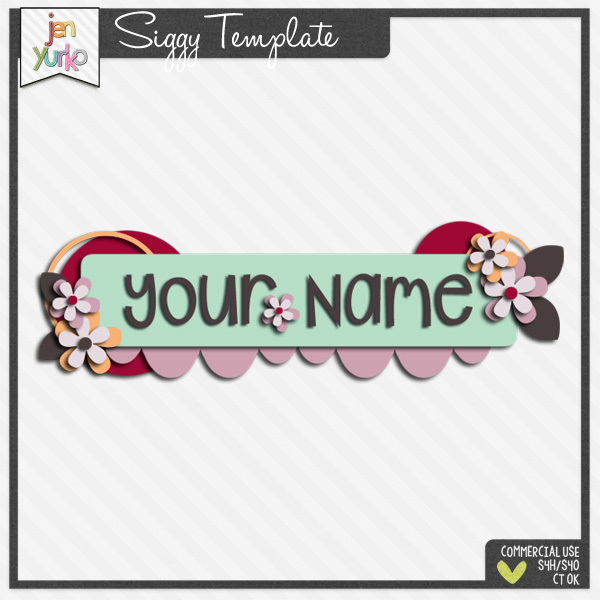 If you are into free templates, you've come to the right place! We've got a lot more for you. Along with other freebies, too. You should definitely make sure you're hooked up to our Pinterest that's full of free stuff. Crafty patterns, printables, digital freebies of all kinds and so much more. Check us out! 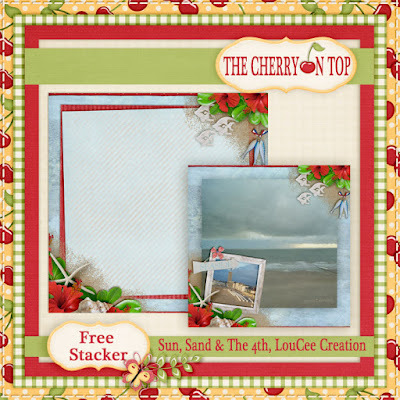 Here are some of our most recent freebies. All of our stuff is free. Do not claim any of it as your own or resell it. Sharing, Pinning and liking is a great way to say thanks. Happy scrappy and thanks for checking out The Cherry!